In attempts to block or delay the nomination of Steven Brennan, Sen. Rand Paul did the impossible: performing a 12 hour filibuster speech, with no restroom breaks, to stop the Senate from nominating Steven Brennan to be the next director of the CIA. 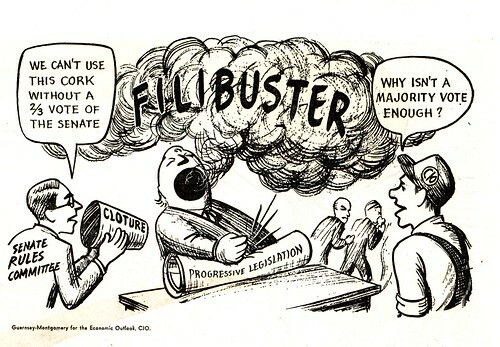 Filibuster, by definition, means “an effort to prevent action in a legislature by making a long speech or a series of speeches.” [This tactic is normally used by a group that doesn’t have enough votes to defeat a bill] Since the Senate Rules allow unlimited time and debate on a bill, a filibuster may be used to attempt a compromise; or more often than not, to draw attention on an issue away from the voting majority. Furthermore, a filibuster speech may not need to be related to the bill. And so, on March 6th, 2013, what started as a rouse, turned out to be a historic moment in Congressional History because it did not at all relate to Steven Brennan’s nomination. But like all good things, at 11:47 pm Sen. Rand Paul ended his 12 hour-long speech and went down in history as the ninth member of Congress to give a long-standing speech on the Congressional floor. He may have gained favor from his party, but he stepped on a few conservative toes: Sen. Jon McCain and Sen. Lindsay Graham. Both senators rejected Paul’s contention that “the Executive Branch lacks the constitutional authority to unilaterally kill Americans on U.S. soil with unmanned drones.” So in the end, did Sen Rand Paul achieve his ultimate goal? He did draw attention on an issue away from the voting majority, but he did not inspire action from the Senate majority to block the nomination of Steven Brennan. So it was a complete and utter waste of time. To have a sworn-in President use drones (flying above our heads) on his own people, on the same soil, is quite sinister; un-patriotic; contradictory; and quite perplexing. My only question is how come there wasn’t this type of fiery speech in Congress during the Bush Administration? Didn’t he misuse and abuse his executive powers during the Iraqi War? Did he commit War Crimes?